I recently organized and published a ten-author collaboration. To say it was a logistical challenge would be an understatement. Spanning ten months and several continents, The Black Fang Betrayal is a tale of mystery and suspense like The Sopranos but with warlocks. The story reinforces the old adage, “the sum is greater than the parts.” Every writer brought a unique style and voice, and yet a single, cohesive story emerged. There are two key points worth considering before discussing specifics. This project proved to me that there is too much emphasis placed on “the meeting” and its significance in the collaborative process. Being an introvert, I prefer written communication. Because I was the project manager for The Black Fang Betrayal, I decided we were not going to “meet” while working on the project. Everything we accomplished from the original concept to the marketing plan for the book launch was done through email and a private Facebook group. We did not use conference calls, webinars, Hangouts or any other method of synchronous communication. This type of collaboration is more about management than writing and as you will see, organization is essential for this type of project. I believe that if a novel can be written this way, just about any collaboration can be successful using the best practices of project management. 1 – It will take longer than you think. There will be issues and setbacks. People will leave the project while others will join the group. Technology will fail. Someone will get angry. Someone will ignore your emails. All of this means it’s essential to allow plenty of time and make the deadlines artificially short. You will likely incur costs up front and if you can, it’s best to have the funds saved and set aside rather than asking the participants for money. You can reimburse yourself from royalties later. Notice that there is a bit of a risk in that you may not ultimately earn enough to recoup your initial costs, so never use funds you’re not willing or able to lose completely. 2 – Keep moving forward. A delicate balance exists between planning for obstacles and enforcing deadlines. You have to do both. However, it’s important that all participants feel as though the project is constantly moving forward. This pace may eventually force one or more members to drop out but you’ll be able to find others who are comfortable with the momentum. Deadlines force a sense of urgency and also hold everyone accountable. Early on in the project, you will get a sense of which participants will meet the deadlines and which ones will not. Be kind and gracious and remember that we all need a little space. Be firm with the deadlines and be persistent in asking for what you need, but do it with a light touch. Your invitation, proposal or pitch will be rejected more times than it is accepted. In fact, some of your invitations will be ignored completely. You may have to ask five to ten times more people just to reach the minimum you need to make the project happen. This is natural and is by no means a reflection on you. People are extremely busy and highly skeptical, especially if the project you’re proposing is unique or different. If someone declines, be respectful and move on. If your invitation is not answered in 48 hours, move on. The initial communication with a prospective collaborator is important because it provides insight on their work habits. Early email responders tend to be early with deadlines and meet all expectations as well. It is not a judgment but merely an observation on human behavior in the workplace. As long as the return communication reaches you within what you consider to be a reasonable response window, accept that person into your collaboration. When you are pitching or asking for participation, make saying “yes” as easy as possible. Provide all of the relevant information upfront and keep it up to date. Rather than include the information in a single correspondence, post it in the Cloud or on a private web page for prospective participants to view easily. This ensures you can always keep the information current for everyone. Don’t make people fill out unnecessary forms or ask them for answers to open-ended questions. Your goal in the pitch is to get a “yes,” so make it simple. Once a participant agrees to be part of your collaboration, give him or her an out as late as possible in the process. Someone might be initially excited about the project but then less so as it veers away from his or her initial understanding. Allow for a graceful exit. At some point in the process it should be made clear (in a written contract) that participants cannot leave the collaboration after a certain date or timeframe, but also understand that people can and will need to opt out due to special circumstances. Make sure to clearly state the minimum level of involvement required by each participant to be a part of the collaboration (such as the minimum word count in the case of The Black Fang Betrayal) but also encourage motivated participants to do more. Prospective collaborators should have only two major deadlines: signing on to your project and submitting a final draft. You will need other items from them along the way, but it helps to frame the scope for collaborators while making it easy for them to participate. 4 – You must lead. As the project manager or the idea generator, you should be passionate about your project. Other people will be excited about it, too. However, it’s natural for the person running the project to be the most invested in its success. At times, you will have to rely on your own passion and motivation to carry the project forward. In order to excite others, you need to be clear in your vision and in how you communicate that vision with the group. 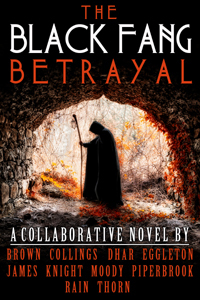 For The Black Fang Betrayal, I structured the collaboration and told each prospective author what would be required of him, providing information on character, setting, genre and plot. Remember, you are asking them to join your collaboration, to follow your lead. If they say “yes” it means they want to be led and are willing to follow you. Take that responsibility seriously but also be aware that decisions by committee can often lead to a mediocre result as everyone tries to find a safe middle ground. Not everyone will agree with every decision you make, but if you are clear in your vision and lead with confidence, they will trust and support you. I hope to improve my leadership skills on my next collaboration. In this one, I neglected to specify the time of the year when the story took place and I didn’t require the final drafts to be formatted in any particular fashion which meant I had to spend extra time fixing those inconsistencies prior to publication. 5 – You must listen. This element of project management is the most difficult to articulate because it comes down to feel. Although your vision must be clear and you should lead with confidence, there will be times when you must solicit feedback from the team. Input is invaluable and ignoring it can be catastrophic. It is not necessary to sit and speak to someone face-to-face to solicit feedback. Meetings, in the traditional sense, are not necessary. Clear and timely communication is essential. When possible, try to structure your questions. For example, rather than asking for open-ended ideas on a particular aspect of the collaboration, give your team two or three choices. Do this in a group setting (such as through a private Facebook group or closed bulletin board) so you can get a sense of the group dynamic. Email is not beneficial in a collaboration of this type because it puts the conversation in silos. You should use email only to deliver important information to the participants and expect that communication to be mostly one-way. Because the group communication requires a different kind of effort than a traditional face-to-face meeting, participants are more likely to be on task and can contribute when they’re most attentive rather than trying to force interest on a specified day and time. 6 – You must be organized. It is impossible to lead a collaboration of any type without being organized. Repeat. It is impossible to lead a collaboration of any type without being organized. Although technical issues will always arise, today’s technology allows greater and more seamless organization than ever before. Through Cloud-based solutions and shared documents, you can keep the project organized from just about anywhere, from any device. Technological tools aside, it is essential to have solid personal organization. If you are not naturally inclined toward organization, you may not be ready to manage a collaboration. However, organization is a learned skill and there is no shortage of resources available for a person who wants to become more efficient and organized. Being organized means utilizing systems (such as iCloud, Google Drive, DropBox, Trello, etc.) in addition to maintaining accurate records. You should keep a spreadsheet of deadlines, save all emails and messages sent to participants, develop a launch plan and more. Save everything you create in a logical folder system and make sure that folder system is in the Cloud or backed up (nightly) to another location. In today’s computing environment, there is no excuse for losing files in a computer crash and nothing will kill your project faster. If that happens, your participants will be frustrated and lose confidence in you and may be less likely to help you pick up the pieces. Avoid the use of paper because it makes it hard on participants. For example, rather than using a fax machine to have participants sign a contract, use a free online document signing site like Docracy. With a free, registered account, contracts are signed through a web browser without the need to print and physically return the document. Remember, you are the project manager and the one most passionate about your project so you should burden most of the responsibility. Your goal should be to make the process as easy as possible for your collaborators. 7 – Enforce structure but do it gently. No matter how passionate, clear, organized and decisive you are as a project manager, there will always be issues that threaten to derail the collaboration. Obstacles will appear that you never anticipated. Frustrations will mount and you will be tempted to give up. This is a natural part of the process. If you’re utilizing the systems you have in place and if you’re motivated to continue, you can keep things on schedule. There will be missed deadlines and misinterpretations. Use a gentle hand to recalibrate and remember that you are dealing with humans. We are all complex, emotional and sometimes irrational creatures. Keep it all in perspective and keep it moving forward. In the end, you’ll be glad you did. I’m thrilled with The Black Fang Betrayal and I wish you success on your own collaboration. Over the next six to eight weeks, I will be featuring guest posts by some of my collaborators from The Black Fang Betrayal. I’ve asked them to share their perspective on the project.